Are you thinking of moving to Auburn? We did some research and found some facts for this article so you don’t have to do the work. some Hispanics, very few African-Americans and some Asians and Native Americans. and in December it is 54. The median home value in Auburn is about $400,000. Rents in Auburn range from about $700-1100. If you look carefully you might be able to find something small for $300,000 or less. In this area, there are also some land parcels for less than $200,000 so you might be able to build a custom home in a less developed area if you like a more natural setting. Moving to Auburn is likely something that would appeal to a person who is tired of living in an urban setting, or wants to find more affordable housing than what exists in big cities. If the median home value in San Francisco is $1.1 million and you get something like a large garden shed to live in, imagine what you can buy in Auburn for less than half of that. For a small town, Auburn has many restaurants — and not just the typical chain options. According to Great Schools, the public schools are rated above average and almost in the good range. For adults, Sierra College, a two-year institution, is located about 10 miles away. Another community college is Folsom Lake which is about 16 miles from Auburn. A little over 20 miles away is American River College, which is a community college too. There are four-year schools in Rocklin and Sacramento: William Jessup University and Cal State University Sacramento. The climate and terrain are favorable for grape growing and there are about 20 wineries in the area. house. There is also a golf course, and Auburn is home to several endurance events like the American River 50-Mile Race. 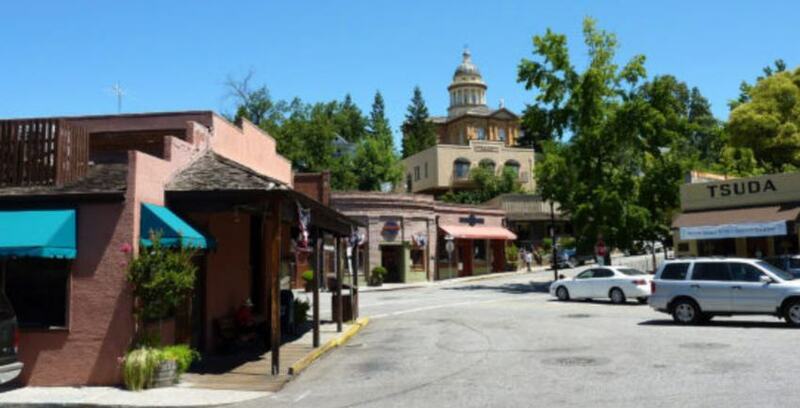 Auburn is situated in the Sierra foothills about 30 miles north of Sacramento and 86 west of Lake Tahoe. Of course, Tahoe can be enjoyed in all seasons: winter sports such as skiing and snowboarding, and all the activities available in warmer months like hiking, camping, swimming, and kayaking. Yosemite Valley is about 218 miles or approximately 4 hours, and this area is noted for its unique beauty. If you want to visit the Pacific Coast, Bodega Bay is about 142 miles west of Auburn. The terrain is hilly with open space, forests, lakes, streams and river habitat. It generally is rural with many small towns. The Eldorado National Forest is only about 15 miles from Auburn, so you can find dense foliage and a quieter setting very easily. Folsom Lake is about 15 miles, and the reservoir at Oroville is around 65 if you want to be around a large body of freshwater. Moving to Auburn is probably going to not disappoint anyone who likes open space and warm weather. You will also have fairly easy access to Sacramento is you have a craving for culture. Auburn is located right on I-80, so you will have very easy access to a major freeway. Sacramento Airport is 30-40 miles if you need to fly, and if you like train travel, there is an Amtrak station right in Auburn. This station serves the Capitol Corridor line which travels from Santa Clara to Auburn. Moving to Auburn might work for someone who likes or needs to use train travel. In Penryn, about 6 miles south of Auburn, there is a Buddhist center. Is there storage in Auburn? Yes, we have a storage facility here and can answer any of your storage questions. So, after reading this information, are you still interested in moving to Auburn?